I'm a big fan of these two authors. Their no-nonsense approach to research is refreshing, and has undoubtedly been one of a number of factors which have placed the Roswell incident at the fore of UFO reality. 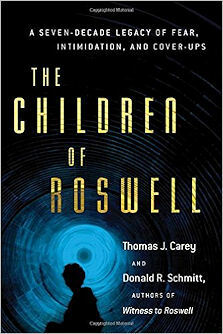 Carey and Schmitt have written several books about Roswell down the years, each essentially an update on their on-going research over a 25 year period. This particular book begins with a wise and thought-provoking overview of why the stasis of non-disclosure persists, despite the well-documented evidence compelling the need for answers from government and the armed forces, which took firm control of this incredible event back in July 1947. Given the probable nature of what actually crashed on the desert floor at that time, it's hardly surprising that the event was buried beneath an Orwellian edifice for so many years, before witnesses finally felt safe enough to come forward... helped no doubt by safety in numbers, and a changing climate towards the rights of the individual before government power post post-war. The book provides an historian's perspective (these two investigative researchers are, at the end of the day, essentially historians) on the social and political context wrapping around the rather innocent protagonists who got swept up in the aftermath of the discovery of the crashed flying saucer and its occupants. The précised account of these events provided in the book is worked up from the intricate and painstaking detective work documented in previous books, already fully referenced, annotated and based in fact. This sets the scene for a chapter-by-chapter description of the stories of the children of Roswell, whose supporting descriptions of what they witnessed remains the last living testament to the event as the Roswell Incident fades inexorably into the foggy murk of history. When I read the accounts of what happened to the locals in the aftermath of the clear-up that took place after the crash, I can't help but think of the people of Roswell as subjects of the U.S. Government, in a way which proud Americans would never find acceptable under any other circumstances. Basically, military bruisers went about visiting witnesses, threatening them that if they ever spoke of what they had seen then they, and their families, would disappear. In at least one case dealt with in this book, that threat may actually have been carried out. These heavy-handed tactics put the fear of God into these folk - and it took decades before any of them would find the courage to speak up. Even then, these witness accounts were often provided in the final days of life, when fear of the government threats no longer held the same power over the victims. The inability to talk about the Incident extended even to conversations among family members. Often such discussions were short, carried out in isolated areas, in hushed whispers. Any hints getting out into the open that items of debris might still be at large, hidden away secretly by Roswellians, was met with immediate visits by squads of soldiers who would ransack ranches (pp160-1), and issue further threats. This climate of fear and subjugation is indeed reminiscent of the fictional 1984. What happened was not allowed to have happened. As Churchill once said, history is written by the victors. In the end, the Government won. What does it matter that we now know what happened from multiple eye-witness testimony which would normally stand up in a court of law sufficient to convict a man? Carl Sagan once said "Extraordinary claims require extraordinary evidence", but really there is no such thing as 'extraordinary evidence', just evidence. The evidence was systematically removed, the site cleansed over several years (p163), the witnesses threatened into a fearful silence, the media manipulated to accept a cover-story and, more importantly, extend a climate of ridicule about UFOs across the decades, which still persists today. Sometimes, the authors would pick up a pattern of leads which would trigger an initially fruitful discussion with new witnesses. But, shortly afterwards, that same witness, appearing mightily stressed, would abruptly close off all contact (p106, p110). One can only surmise that monitoring - and threatening - are still going on. A lot can be gleaned from this book about the ways to conduct and document good investigations. There is much about judging characters and motives, realising when one is being led up a blind alley, getting the most out of an indecisive witness (as any good barrister would), and how to mop up the mess left by the bogus 'star witness' Frank Kaufmann. Unfortunately, there were too many ungrammatical and disjointed sentences, leading me to believe that at least some of the book had been patched together from previous writings. But, given the volume of material the researchers had accumulated and written about down the years, this is hardly that surprising. In the end, the content and quality of writing more than made up for the syntax errors. This is another powerful book about Roswell. One day, hopefully, the Wall will come down, and we won't need to continue banging our heads against it. Subtitled "A Seven-Decade Legacy of Fear, Intimidation, and Cover-ups"